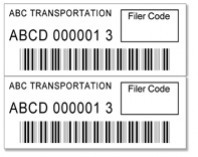 If you only need 1 PAPS labels set, and you already have a SCAC code then you can purchase 1 label individually. Please make sure you provide your e-mail address. If you plan to purchase printed paps labels also, click HERE and save on you same day PAPS label.